Savannah River Site Liquid Waste Contractor Sets Safe Work Hour Records; Portsmouth Contractor Earns 97 Percent of Available Fee for FY17 Performance; EM Releases New Site-Specific Infographics on Cleanup Progress; and Much More! 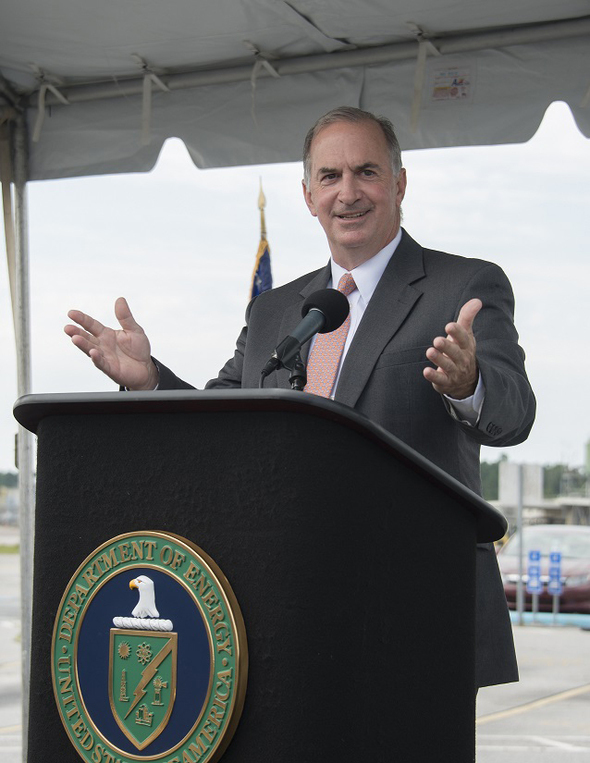 Matthew Moury, DOE Associate Under Secretary for Environment, Health, Safety and Security, pictured, joined Savannah River Site senior officials and nearly 1,500 Savannah River Remediation employees at an event to recognize the liquid waste contractor. The company recently set records by surpassing 8.5 million operational hours and 30 million construction hours without injury resulting in a missed day of work. AIKEN, S.C. – DOE headquarters and Savannah River Site (SRS) officials recognized nearly 1,500 Savannah River Remediation (SRR) employees for setting SRR records by surpassing 8.5 million operational hours and 30 million construction hours without injury resulting in a missed day of work. Matthew Moury, DOE Associate Under Secretary for Environment, Health, Safety and Security, Michael Budney, DOE-Savannah River manager, Mark Whitney, chief operating officer of the nuclear and environment strategic business unit for AECOM, SRR’s parent company, and Tom Foster, president and project manager of SRR, spoke to SRS federal and contractor employees, stakeholders, and guests at an event to mark the records. The achievements underscore DOE’s commitment to strong safety culture, Moury told the audience. “One way the Department of Energy is committed to excellence in safety is by fostering a safe work environment in all operations at SRS. 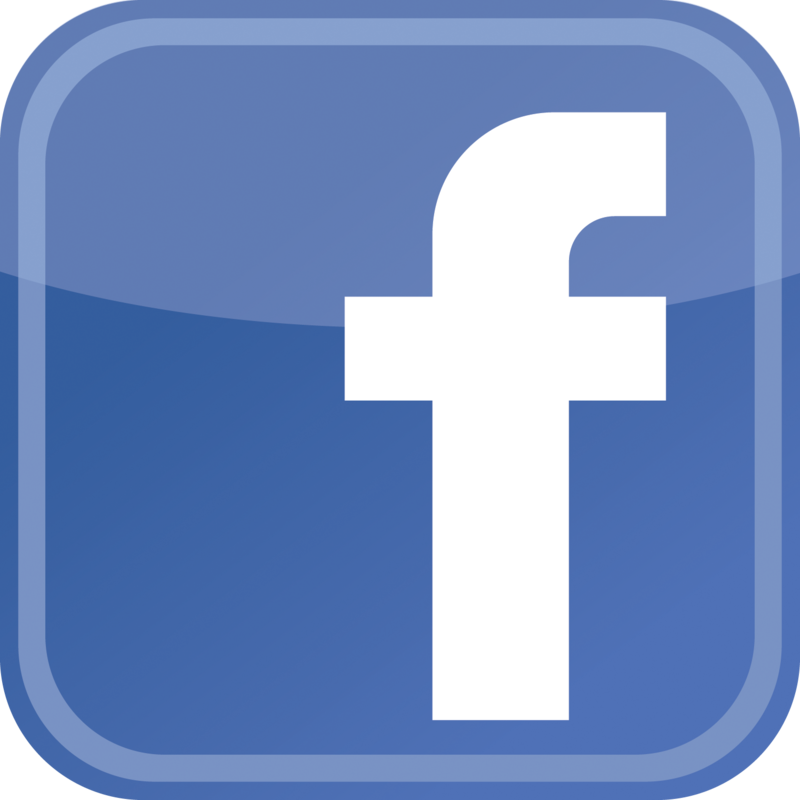 It is an expectation that a positive safety culture is felt and communicated by every employee,” he said. It’s the first time SRR crossed the 8.5-million-hour threshold under its EM contract, which began July 1, 2009. SRR recorded its previous safety record in 2015 when employees reached 6.5 million hours without injury resulting in a missed day of work. The SRR construction workforce surpassed the 30-million-hour mark this month, representing 20 years of construction work without injury resulting in a days-away case. Workers reached this achievement under SRR and former SRS contractor Washington Savannah River Company (WSRC). 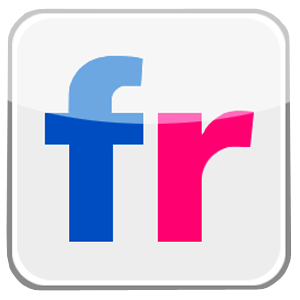 SRR is a heritage company to WSRC. At the event, Budney said DOE places a priority on the liquid waste mission and commended employees for safely accomplishing important work. Whitney said he is honored to be part of an exemplary workforce. 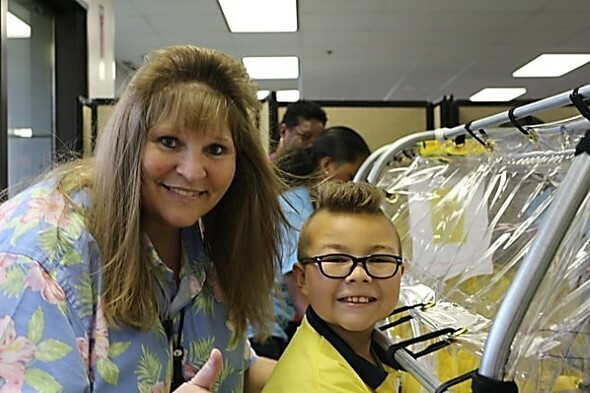 The celebration followed the recent restart of liquid waste operations after a comprehensive 15-month outage to upgrade equipment and facilities in the liquid waste system. Completing construction of the site’s first mega-volume Saltstone Disposal Unit (SDU) 6 and beginning construction on SDU 7. At right, Tim Medukas and Kaitlyn Weaver of RSI EnTech prepare materials for an annual test of decontamination and decommissioning contractor Fluor-BWXT (FBP) processes and instruments at the Portsmouth Gaseous Diffusion Plant site in Piketon, Ohio, while FBP project services technician Kyle Rase, left, observes. PIKETON, Ohio – EM’s Portsmouth Site environmental technical support services contractor, RSI EnTech, scored an “excellent” overall evaluation for its fiscal year 2017 (FY17) performance, earning $429,281, or 97 percent, of the available fee. The contractor excelled in administrative support, environmental safety, health, quality assurance, and field support, and provided “very good” program management support, according to a scorecard released by EM’s Portsmouth/Paducah Project Office (PPPO). Each year EM releases information relating to contractor fee payments — earned by completing the work called for in the contracts — to further transparency in its cleanup program. PPPO’s evaluation acknowledged RSI’s 3,000 days without a first-aid or other reportable safety incident, along with its initiation of safety programs like behavior-based safety practices, safety workgroups, and weekly “Toolbox Talks.” PPPO further commended the contractor for flexibility and timeliness in responding to requests for budget information and technical evaluations of contract actions. The scorecard also cited the contractor’s cost performance and its cost- and schedule-savings recommendations provided to PPPO and cleanup contractor Fluor-BWXT. View the RSI FY17 scorecard here. WASHINGTON, D.C. – EM recently updated its “By the Numbers” infographics filled with quick and clear metrics demonstrating EM’s cleanup progress. A total of 14 infographics — one for each major cleanup site and EM’s Savannah River National Laboratory — are available on this EM webpage. 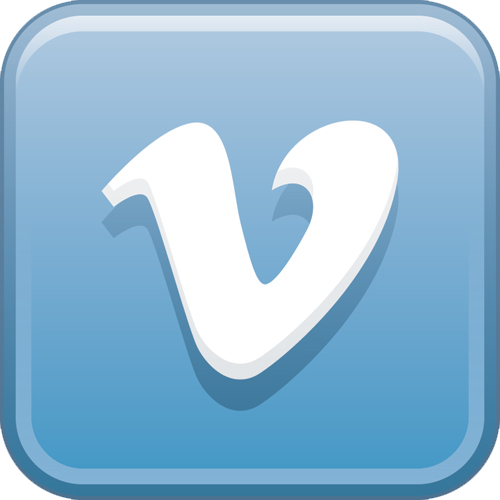 The easy-to-read, one-page infographics summarize each site’s history before delving into eye-catching statistics. For example, the Oak Ridge Office of Environmental Management’s infographic points out that crews there prevented 5,000 pounds of mercury from entering the environment. Energy Technology Engineering Center — The DOE, California Department of Toxic Substances Control, and Environmental Protection Agency completed soil characterization for about 300 acres of land, taking more than 3,600 radionuclide samples, 6,500 chemical samples, and 100 soil vapor samples. 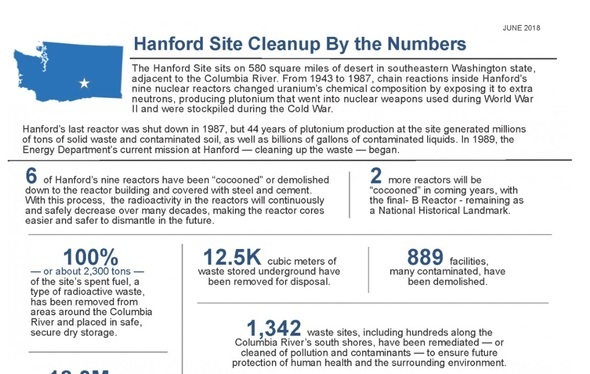 Hanford Site — Workers have demolished 889 facilities, many contaminated. Idaho Site — Crews retrieved 65,000 cubic meters of stored transuranic waste, 50,000 meters of it from under a soil berm inside a building large enough to house an aircraft carrier. Los Alamos National Laboratory Site — The Los Alamos Field Office completed treatment of 60 remediated nitrate salt drums in November 2017 and finished treatment of 27 unremediated nitrate salt drums in March 2018. Moab Site — 9.1 million tons of uranium mill tailings have been shipped to a dedicated disposal cell, amounting to 57 percent of the total tons. Nevada National Security Site — Since 1961, nearly 49 million cubic feet of classified, low-level and mixed low-level radioactive waste have been disposed at the Area 3 and Area 5 Radioactive Waste Management Sites. Oak Ridge Site — 1,067 acres of land have been transferred to the community for industrial growth and economic redevelopment. Paducah Site — More than 66 million pounds of contaminated scrap metal — enough to build a World War I battleship — have been removed from storage yards and shipped off-site for disposal. Contaminated scrap metal was a major contributor to surface water contamination. Portsmouth Site — More than 119 million pounds of waste have been shipped and disposed off-site to date. Savannah River Site — More than 4,160 canisters of glassified radioactive waste have been produced at the Defense Waste Processing Facility since it began operating in 1996. Savannah River National Laboratory — Over $5 billion in complex-wide savings have been achieved for the EM program due to innovations developed at the laboratory in the past 5 years. Separations Process Research Unit — More than 9,700 gallons of residual liquid from tanks have been treated through solidification. Waste Isolation Pilot Plant — 172,721 containers have been emplaced in the WIPP underground. West Valley Demonstration Project — More than 6.5 miles of piping and over 50 tons of vessels and equipment have been removed from predominantly high-hazard areas of the former reprocessing plant. 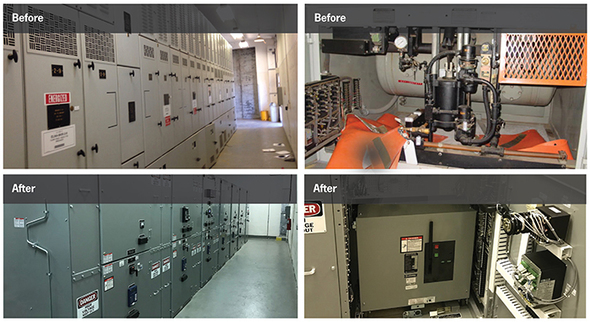 Before and after photos of the K and L areas power distribution system project. AIKEN, S.C. – The Savannah River Site (SRS) recently finished a major infrastructure project five months ahead of schedule and $3.9 million under budget. SRS management and operations contractor Savannah River Nuclear Solutions (SRNS) safely replaced 60-year-old power distribution equipment at the K and L areas to ensure key nuclear materials and spent nuclear fuel storage facilities continue to operate. K Area provides for the handling and interim storage of excess plutonium and other special nuclear materials. L Area is the consolidation point for all aluminum-clad used nuclear fuel from research reactors worldwide. Crews completed the work without interrupting operations. The power distribution system that was replaced had entered service in 1951. 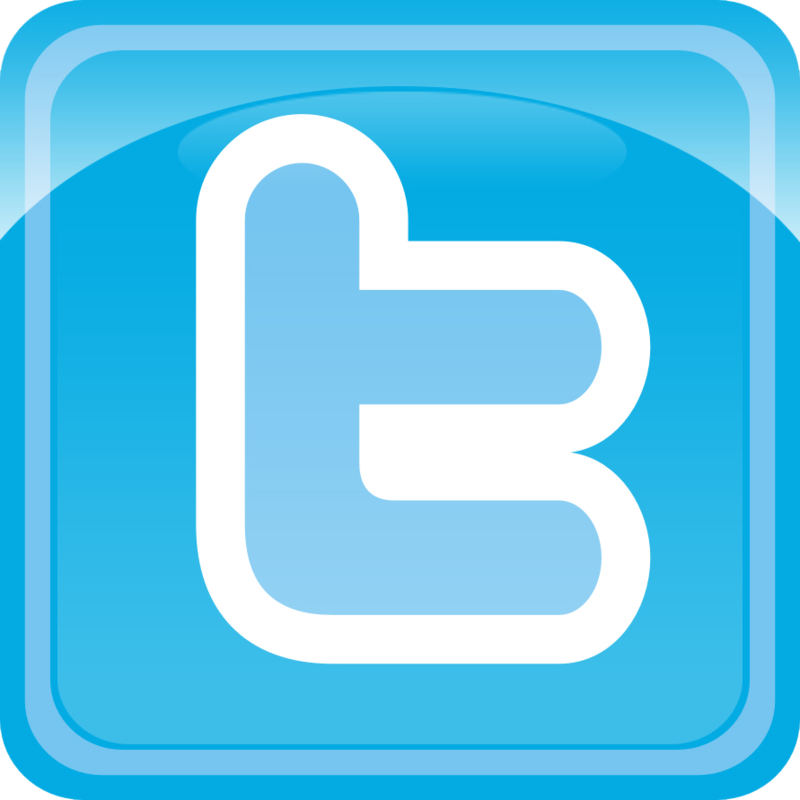 It has experienced an increase in outages in recent years and replacement parts were no longer commercially available. Additionally, legacy switches ran on compressed air, and the air tanks had degraded such that workers could not access the facilities unless power to the facility was completely turned off. Though the K and L area projects were separate, they were managed as one project to increase efficiency. 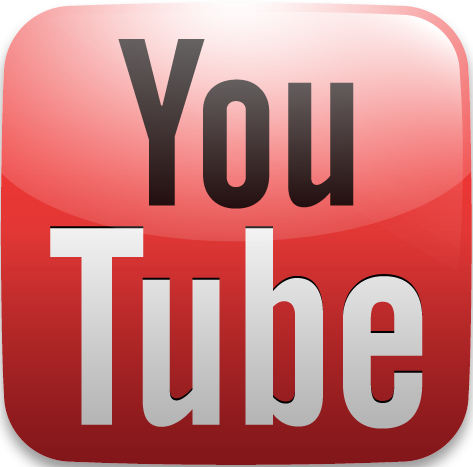 The $19 million project was funded by EM and the National Nuclear Security Administration. 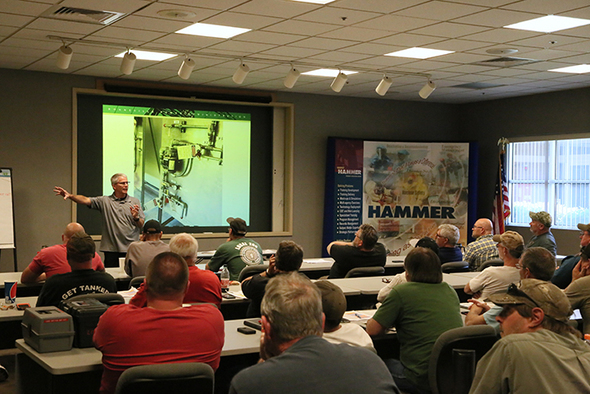 Kalle Hyrkas, certified safety professional and manager of the “lockout/tagout” program at the HAMMER Federal Training Center, provides training for Bonneville Power Administration employees as part of a recent safety workshop. RICHLAND, Wash. – EM’s Volpentest Hazardous Materials Management and Emergency Response (HAMMER) Federal Training Center at the Hanford Site recently hosted a safety workshop for more than 200 Bonneville Power Administration (BPA) employees. The training will help BPA construction crews work safely and fulfill annual training requirements. 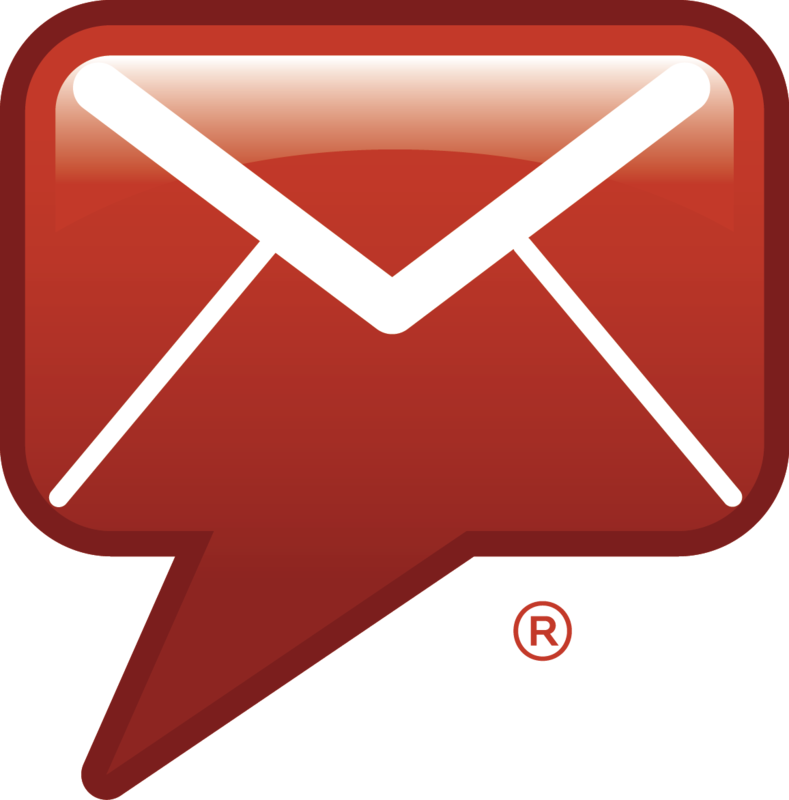 BPA is a nonprofit power marketing administration owned and operated by DOE in the Pacific Northwest. “Sharing the HAMMER facilities helps our sister organization and utilizes some of the expertise at HAMMER, the experts in working safely,” said Jill Conrad, EM Richland Operations Office HAMMER program manager. 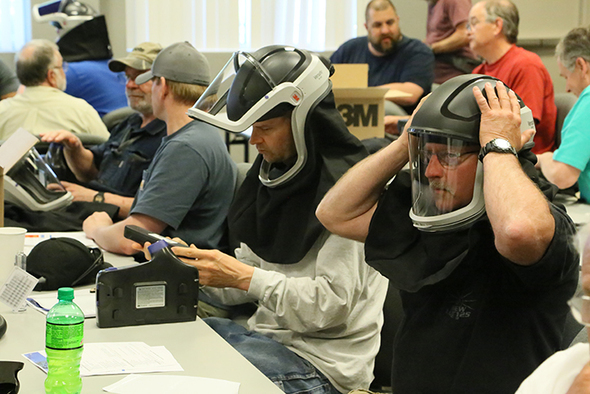 Bonneville Power Administration employees participate in hands-on training with helmets that contain powered air-purifying respirators in a course led by worker-trainers at the HAMMER Federal Training Center. HAMMER provided Occupational Safety and Health Administration certified courses in controlling hazardous energy (known as “lockout/tagout”), awareness courses for materials containing lead, and hands-on training and demonstrations on helmets with powered air-purifying respirators specific to BPA needs. BPA and other instructors taught courses in first-aid, CPR, automated external defibrillators, machine hazards, electrical hazards, and fire extinguishers. HAMMER operations staff provided critical support in preparing for the large-scale event, which required logistics management, transfer of equipment and props, and significant scheduling. 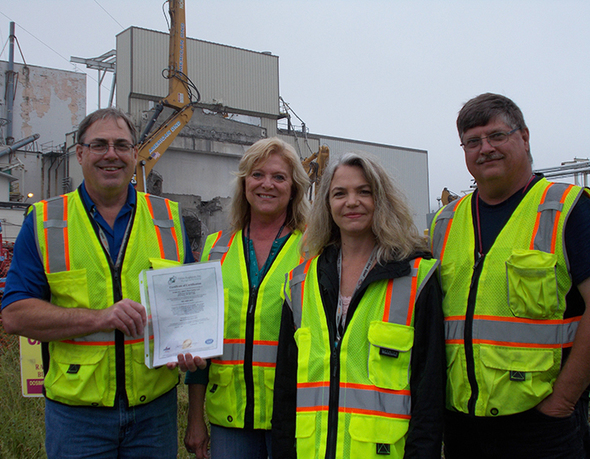 CH2M HILL BWXT West Valley Regulatory Strategy team members, left to right, Jerry Hoch, Janice Williams, Kim Mansfield, and David Klenk show the site’s environmental management system program certificate issued by the International Organization for Standardization. WEST VALLEY, N.Y. – The International Organization for Standardization (ISO) recently certified EM’s West Valley Demonstration Project (WVDP) for new requirements for the site’s environmental management system (EMS). A revised standard by ISO specifies requirements for an EMS that WVDP can implement to minimize environmental impacts from cleanup operations. With a membership of 161 national standards bodies, the independent, non-governmental international organization brings together experts to develop voluntary international standards that support innovation and provide solutions to global challenges. WVDP received the certification under its prime contractor CH2M HILL BWXT West Valley (CHBWV). The revised standard calls for greater accountability from leadership, enhanced proactive environmental initiatives, improved communication internally and externally, and more rigorous environmental risk evaluations. To earn the certification, WVDP and CHBWV conducted an analysis of the EMS program against the new standard, subsequent revisions based on the analysis, and a third-party review of the revised program. Hanford Site Radiological Control Technician Kathy Keelean, left, conducted a radiological survey on Jack the falcon. His handler, Chase H. Delles, is at right. RICHLAND, Wash. – Employees at the Hanford Site teamed up to rescue a missing domesticated falcon that had made the site a temporary home. 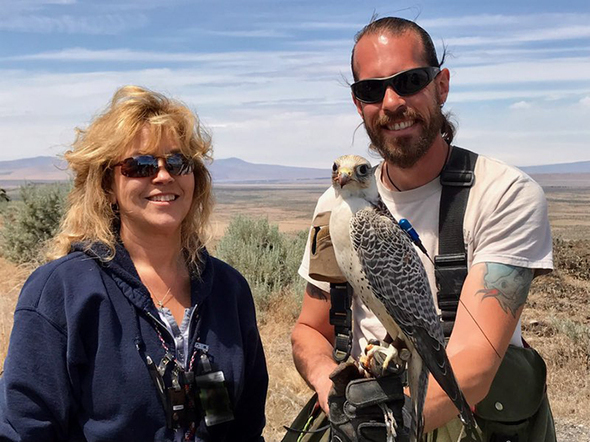 JR Jamerson, a site security representative with EM Richland Operations Office (RL) contractor Mission Support Alliance (MSA), was contacted by Chase H. Delles, a falcon hander whose raptor, Jack, hadn’t returned after working to clear pigeons out of a local cherry orchard. Jamerson coordinated a team of experts from across Hanford to find Jack. Using Jack's GPS device, the team located him near the center of the 580-square-mile government site. Hanford Patrol then escorted the handler to retrieve the falcon. 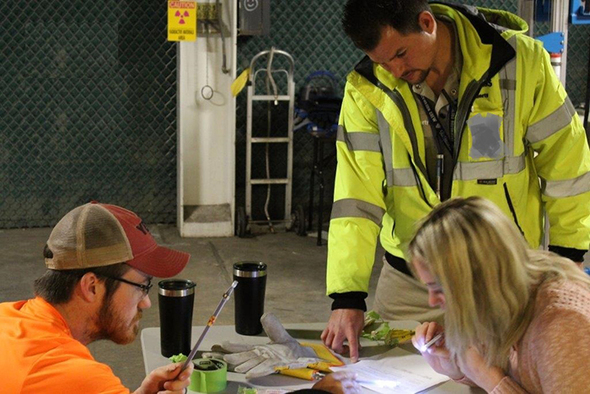 As a part of the site’s environmental monitoring program, a Hanford radiological technician conducted a radiological survey of the falcon and detected no contamination. 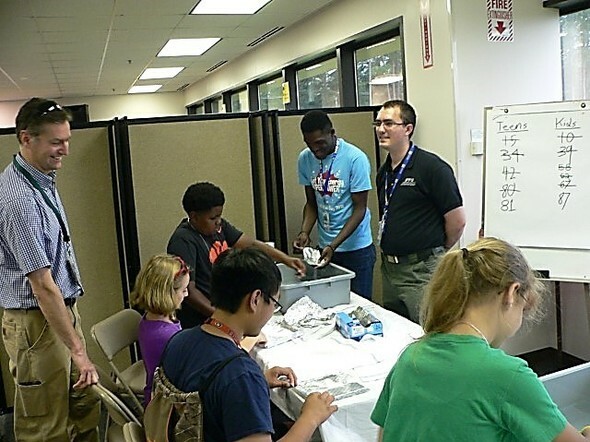 Next generation radiation protection specialists learn about contamination and proper “dress-out” techniques before working with a glovebox. Using marshmallows and toothpicks, children construct buildings and learn about structural integrity. Kids design tinfoil boats with the challenge of keeping them afloat with the addition of coins. 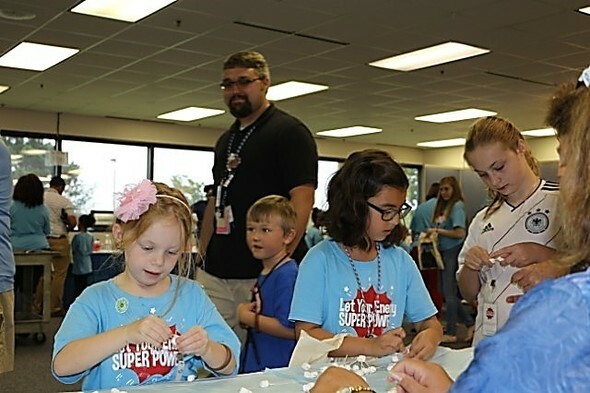 AIKEN, S.C. – Wearing “Let Your Energy Be Your Super Power” t-shirts, more than 300 school-age children recently joined their parents and mentors for the Savannah River Site (SRS) Kids Day. The DOE-Savannah River Operations Office partnered with Centerra-SRS, the site’s security contractor, to host the educational event featuring hands-on science and technology activities, including visits with Smokey Bear and training on radiation protection “dress-out” techniques. Launched in 1993 with roughly 50 participating children, the kids day is designed to help children explore career options; gain exposure to workplace skills; understand the importance of staying in school; and shadow parents and mentors to better appreciate their jobs. In the photo above, Savannah River Ecology Laboratory (SREL) employees provide hands-on learning on the biodiversity of Savannah River Site ecosystems and research the laboratory has conducted at the site since 1967. 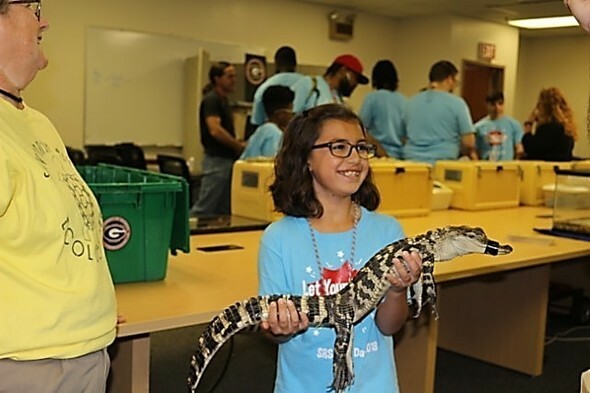 Its researchers have captured, marked, and released more than 1 million amphibians and reptiles representing 100 species, including this young American Alligator.